History: 40 year old female with right upper quadrant pain. 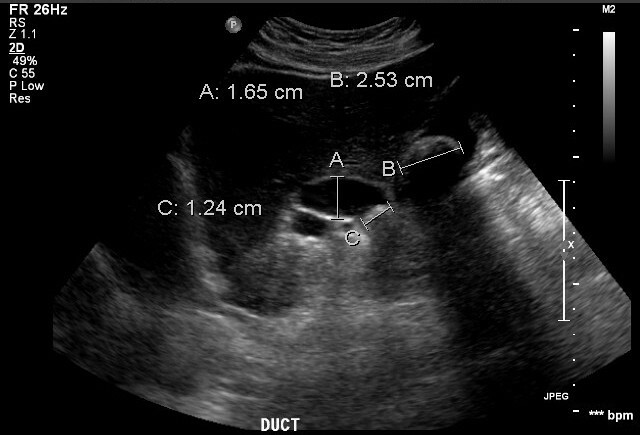 Choledocholithiasis: Ultraound of the right upper quadrant of the abdomen shows a markedly dilated common bile duct measuring 1.65 cm (labeled A), a large stone with posterior acoustic shadowing in the gallbladder (labeled B) and a stone within the common bile duct (labeled C). This constellation of findings gives the diagnosis of choledocholithiasis, which is the presence of a stone within the biliary ductal system. A classic ultrasound finding with calcified stones is posterior acoustic shadowing, however, the appearance of gallstones is based upon the location, size, and composition. The best imaging tools to evaluate choledocholithiasis is ultrasound or magnetic resonance cholangiopancreatography (MRCP). The differential diagnosis for bile duct obstruction includes choledocholithiasis, cholangiocarcinoma, pancreatic or ampullary carcinoma, and infection with parasites. Choledocholithiasis can be primary when stones develop within the biliary ducts, or they can be secondary, as in this case, when a stone likely comes from the gallbladder upstream. Complications include cholangitis, obstructive jaundice, pancreatitis, and biliary cirrhosis. Credit to Paul Murphy, M.D., Ph.D. for this great case.